Two newly published plays | Damian Trasler's Secret Blog - Do Not Read! In the final burst of the latest publishing round from Lazy Bee Scripts, two of my latest one act plays have reached the light of day. “Digging Up Edwin Plant” works either as a standalone piece, or as a sequel to “The Kitchen Skirmishes“. It features Bernard and Lucy, now well adapted to their roles as parents, but Bernard has developed an unhealthy curiosity about what happened to the boy who used to bully him at school. Based in part on personal experiences and featuring more poetry than you might expect for a one act play, this piece looks at how we remember people who have passed out of our lives, and who, exactly, forgiveness is for. I wrote this after seeing a group had produced their own play based on the works of a local poet. This seemed like a fine idea, so I dug out the mysterious poems of Edwin Plant, after checking there’d be no copyright issues, and used them to help tell the story I was thinking of : Bernard, unable to track down the bully, finds only some poems written by someone with the same name. Is it the bully? What do the poems say about the person who wrote them? Bernard sees regret, and a possible explanation for the behaviour of the boy he knew, but Lucy isn’t convinced. 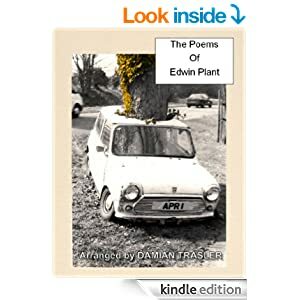 “The Poems of Edwin Plant” e-book is available on Amazon Kindle. This entry was posted in Play in Focus, Writing and tagged cosplay, Damian Trasler, Edwin Plant, FanExpo, Kitchen Skirmishes, play scripts, plays, read a script. Bookmark the permalink.